Immersed in Englishness, cup of tea in hand, I pillaged the brambles along the doctors’ fence at the back of my grandparents’ house, and I am now standing by the stove skimming scum from a batch of warm blackberry apple jam and waiting for a batch of scones to brown in the oven. These are pretty special scones because they have a handful of blackberries tossed in sugar thrown into the mixture at the last minute, so they are studded with deep purple. Douglas Adams’s writing about the art of the cup of tea is so fabulous I’ve re-printed it here in full, but you can find it here on his website too – as well as lots of other treasures. One or two Americans have asked me why it is that the English like tea so much, which never seems to them to be a very good drink. To understand, you have to know how to make it properly. There is a very simple principle to the making of tea and it’s this – to get the proper flavour of tea, the water has to be boiling (not boiled) when it hits the tea leaves. If it’s merely hot then the tea will be insipid. That’s why we English have these odd rituals, such as warming the teapot first (so as not to cause the boiling water to cool down too fast as it hits the pot). And that’s why the American habit of bringing a teacup, a tea bag and a pot of hot water to the table is merely the perfect way of making a thin, pale, watery cup of tea that nobody in their right mind would want to drink. The Americans are all mystified about why the English make such a big thing out of tea because most Americans have never had a good cup of tea. That’s why they don’t understand. In fact the truth of the matter is that most English people don’t know how to make tea any more either, and most people drink cheap instant coffee instead, which is a pity, and gives Americans the impression that the English are just generally clueless about hot stimulants. So the best advice I can give to an American arriving in England is this. Go to Marks and Spencer and buy a packet of Earl Grey tea. Go back to where you’re staying and boil a kettle of water. While it is coming to the boil, open the sealed packet and sniff. Careful – you may feel a bit dizzy, but this is in fact perfectly legal. When the kettle has boiled, pour a little of it into a tea pot, swirl it around and tip it out again. Put a couple (or three, depending on the size of the pot) of tea bags into the pot (If I was really trying to lead you into the paths of righteousness I would tell you to use free leaves rather than bags, but let’s just take this in easy stages). Bring the kettle back up to the boil, and then pour the boiling water as quickly as you can into the pot. Let it stand for two or three minutes, and then pour it into a cup. Some people will tell you that you shouldn’t have milk with Earl Grey, just a slice of lemon. Screw them. I like it with milk. If you think you will like it with milk then it’s probably best to put some milk into the bottom of the cup before you pour in the tea1. If you pour milk into a cup of hot tea you will scald the milk. If you think you will prefer it with a slice of lemon then, well, add a slice of lemon. Drink it. After a few moments you will begin to think that the place you’ve come to isn’t maybe quite so strange and crazy after all. 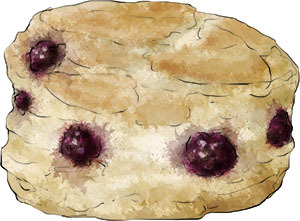 This entry was posted in The Wednesday Tipple and tagged afternoon tea, blackberry, emo scone, jam, scone, tea. Bookmark the permalink.